I just finished a book by Mark Stavish called The Inner Way – The Power of Prayer and Belief in Spiritual Practice. Prayer is a very powerful tool that we have in our armory of magickal tools and one that is often overlooked. This is my review from Strange Book Reviews – my book review website. Five-stars from me for a wonderful book. There are books that you read, enjoy, perhaps assimilate a little of, and then consign to the dusty shelf of books once read but never retouched. There are other books that you read turning page after page, eager to move on, knowing that to properly assimilated, the book will need to be kept close at hand to be read, reread and dipped into when necessary. 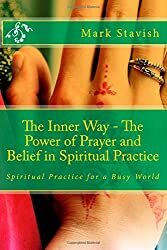 These latter types of books are few and far between but, The Inner Way – The Power of Prayer and Belief in Spiritual Practice is certainly one of them. A few years ago, I made a determination that, to all intents and purposes, I was on my own when it came to pursuit of the esoteric and spiritual. To a large degree, I actually tried not to read books on the topic for answers so much as for corroboration and to regenerate my enthusiasm for the search. I simply came to realize that the answers were actually all known to me – the inner me. Other people’s answers may show the way to heaven or to hell, but it was their answer not mine. All I had to do (as if this is in any way an easy task – it is not) was to seek the answers there within myself. This book, it seems to me, concurs with that view, reminding me of how to do this, and providing the tools and techniques all at the same time. Fundamentally, the book is about prayer. Yes, prayer. How many books on occult techniques and practices ever really get to grips with prayer? Prayer is a fundamental aspect of spiritual practice and one that seems to me to be remarkably undervalued and mostly overlooked these days. This book gets to grips with prayer – what it is, why it is important and provides guidance on how to prayer. For that fact alone, it is, in my opinion, an essential addition to any library of occult classics. However, the appendices (which form around half of the book) contain a great deal of additional information supplemented with many and varied references that are also invaluable. These appendices are in of themselves a veritable treasure trove of wisdom, reference sources and meditation material. I particularly enjoyed the ideas contained regarding magic in the modern world and in creating reality. Mr. Stavish and his colleagues have produced a classic text here. Highly recommended. A few weeks ago, someone posted in the local Brno-based group on Facebook that the supermarkets here always had empty shelves and that they couldn’t find a number of food items that they were used to in Germany. Politely, I made the comment that I never had experienced that problem and pointed them to a number of locations stocking the items that they needed. I also made the remark that we must live in parallel universes. Not knowing me, that comment was taken the wrong way but I actually meant it. To me, this was another example of magic at work. We get what we expect. The German plainly had an expectation contrary to mine, that the supermarket shelves were often empty and, as a result, they were. On the other hand, my expectations are that supermarkets are well stocked and for me, they are. I expect poor customer service here and thats often what I get. My fault. I should try better to expect good customer service! A couple of weeks ago, my salary was sent early from the USA due to the holidays there. The money should have arrived by Wednesday. On Thursday, it had not arrived and I began to worry that it had got lost. Modern banking isn’t reliable and they do make mistakes. About every 4 months, my money goes missing. It vaporizes into thin air between the US and the Czech Republic and none of the banks will ever admit it is their fault nor that they know where my money is. Usually, it either eventually arrives or it ends up back in our company account in the USA. The problem is that as soon as the money isn’t there, I begin to expect that the banks have yet again screwed it up. This time, however, I decided I wasn’t going to let that happen. My remedy was to pray. Yes – pray. I sat and I focused my mind. God is everywhere, all knowing and all seeing. I thanked the all knowing, all seeing Deity for my blessings and then asked that my money show up the next day. I pictured the money sitting on my account. I visualized my money being in my bank account when I checked it online the next morning. I made myself believe that there was no possible way for it not to be there. There was not a shadow of a doubt in my mind since the Deity is all seeing, all knowing and all powerful, there was nothing else to do but confidently await the next day. The money was of course there. This is how prayer works. This is how magic works and this is how we create reality. Perhaps a good example of this is when you simply know something is so. There are times when I know that Hull City will win or lose or draw. I don’t mean I fancy a win or a loss I mean I KNOW. I am always right in these instances without fail. The KNOWING is faith in an outcome so strong that no other outcome is possible. None. Prayer is a key part of life and of creating our lives. Proper prayer cannot fail to produce results. Proper prayer involves visualization and it can be a willful act of magic. Prayer should be a conversation with the Creator that begins with thanks and gratitude. Give it a try. It works.